Bathroom mold is common, and there's no reason to panic if a small spot appears on a shower tile. However, professional help is recommended when there is a serious mold problem, which is why the experts at Healthy Spaces are here to help. 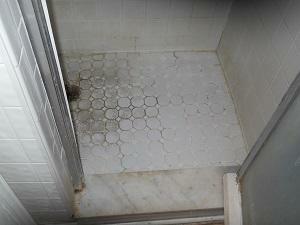 We provide complete bathroom mold removal services, including removal of black mold. Call us today at 1-833-782-0040 or click below to get an inspection and a free mold remediation estimate in Evansville, Owensboro, Newburgh and the nearby areas. Mold growth can spread quickly in the bathroom, which is why it's essential to get professional remediation. The pros at Healthy Spaces can safely remove damaged materials such as drywall, flooring, and tile while ensuring proper containment, cleaning, and ventilation. We can also help you improve the ventilation in your bathroom and help eliminate sources of excess moisture that can cause mold growth. Our experts are fully trained and certified to diagnose and safely remove all types of mold. If you're concerned about mold growth in your bathroom, call us today at 1-833-782-0040 or contact us online to get a free estimate on mold removal and remediation. We provide all our services in Evansville, Owensboro, Newburgh, Henderson, Vincennes, Madisonville, Jasper, Haubstadt, Washington, Sheperdsville and the surrounding areas.